We are a family-operated farm in Alpharetta, Georgia specializing in starting and bringing along Sport Horse Prospects - including Purebred Connemaras, Connemara Crosses, and Irish Sport horses. < a=" < a="This site is a member of WebRing. < a="
2015 colt Sired by Glencarrig Dolphin, Connemara pony stallion and Premium graded stallion out of Triple Echo, 7/8 TB and grade 1 mare by Primitive Rising. These are our current competition horses. They are also our friends and companions and since they live with us, are our pets! Horses trained and sold, Irish Sport horses and Connemara crosses trained and sold. 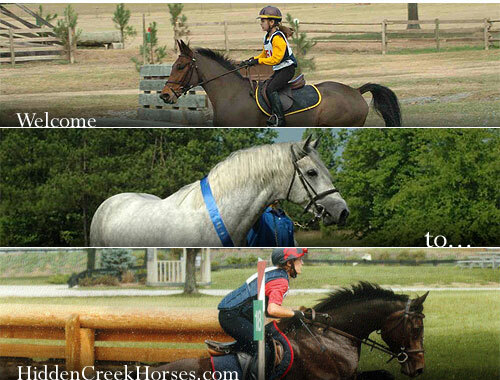 A short history of Hidden Creek Sport Horses and it's founders. Billy Cavalier (BC) is a 2013 Anglo European Sport Horse stallion bred by the Billy Stud. He is a combination of the best European jumping and Irish Eventing bloodlines.